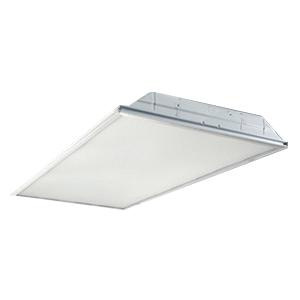 Cooper Lighting Metalux™ GRLED Collection Standard general-purpose LED troffer in reflective white enamel finish, features cold-rolled steel housing. This troffer with grid/lay-in trim, has 12 pattern 0.125-Inch acrylic prismatic lens shade. It has one 23-Watt 85 CRI 3500K LED 4 lamp to offer 2400-Lumens of light output. Lamp has voltage rating of 120 - 277-Volts and offers average life of 60000 hours. The square troffer with one 0 - 10-Volt dimming driver, is ceiling mountable. It measures 24-Inch x 24-Inch x 3-1/4-Inch. It withstands ambient temperature rating of 25 deg C. It is suitable for use in commercial office spaces, schools, hospitals or retail merchandising areas. Troffer is UL/cULus listed and RoHS compliant.